Twelve-week-old Savannah is a Shepherd mix ready for adoption at Barely Used Pets. Tillie, age 6, is a no-front-claws cat ready for adoption at PAWS Animal Shelter. Cartwright is a 10-week-old male kitten waiting to be adopted at the Champaign County Animal Welfare League. Five 10-week-old male pups are up for adoption at the Champaign County Animal Welfare League. You may ask yourself, what is more fun than a puppy? Well the answer is a bunch of puppies! 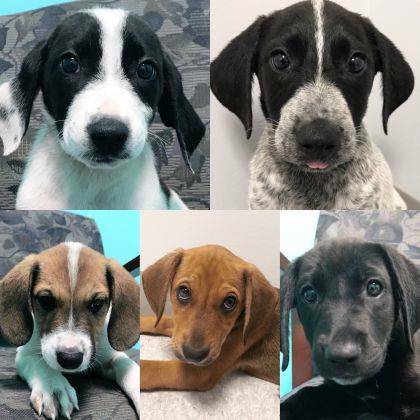 A gang of five playful hound-mix puppies have taken over at The Champaign County Animal Welfare League (CCAWL). All five boys have been microchipped and fully vetted including neutering as well as all age-appropriate vaccinations. They are 10 weeks old and come in a variety of colors. All of them are anxious to be in a loving home with their own human to love. We know their mama is a Beagle, but no one is talking about dad. This type of dog is a working dog, good for hunting, but a companion at the same time. They would do well with children who know about a dog’s personal space. These puppies are not house trained, but could learn quickly. 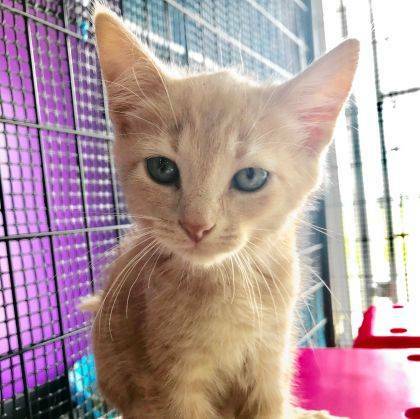 If interested in these cuties, you must have an approved application, which can be found on our web-page www.champaigncoanimalwelfareleague.com, or come to our facility during business hours. All of our other canine adoption listings may be found on petfinder.com or adoptapet.com. The facility is located at 3858 state Route 56, Mechanicsburg, OH 43044. Hours are Tuesday and Saturday noon to 2 p.m., Wednesday through Friday noon to 6 p.m. (All adoptions stop at 5:30 p.m.) For more information, please call 937-834-5236. Memberships are available that will allow you to have access to our 72-acre campus. You’ll be able to use the agility course, indoor/outdoor dog park, grooming facility,and trails. An individual membership is $100 for the year and a family membership is $150 a year. The nonprofit CCAWL is looking for dependable, animal lover volunteers. If you are interested, please stop by our facility or go to our webpage for an application www.champaigncoanimalwelfareleague.com. A list of needed supplies may be found on our webpage and on Fcebook. The Champaign County Animal Welfare League (CCAWL) has a kitty looking for his purrfect, furrever home. He is a 10-week-old buff tiger. Cartwright is loving and spunky, but a laid back kitten. He likes other kittens and attention from humans. Cartwright enjoys napping in cubby holes in his cat tree. He also loves feathers and toy mice. Cartwright is litter trained and current on his required kitten vaccines. He has been tested negative for FeLV/FIV and has been dewormed as well as neutered and microchipped. Cartwright is a special kitten that would brighten any home. If you are interested in making Cartwright a part of your family, please come out to our facility during business hours and fill out an application. The Pizza Alley in Mechanicsburg will donate 5 percent of all sales to the Champaign Co. Animal Welfare League. The CCAWL was created to establish and operate an animal preserve, pet cemetery, dog training facility and rehabilitation home for unwanted pets. The CCAWL also provides a low cost Spay & Neuter Clinic that is open to the public. My name is Savannah and I am a 12-week-old Shepherd-mix girl. I am already spayed and have my shots. I weigh about 15 pounds. I love kids, don’t mind cats, and I play well with other dogs. You know since I’m just a puppy girl that I will need some house-training after we get home. My adoption fee is $150. Tillie has been at PAWS since 2014, so she is one of our longer-stay residents. She is very sweet and is front-declawed. She loves attention and is friendly when she gets to know you. She thoroughly enjoys being petted. 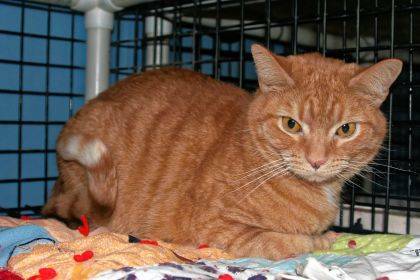 She’s approximately 6 years old, and she would do best in a low-activity home. She was tested negative for feline leukemia/FIV and is up-to-date on her shots. She has been spayed. 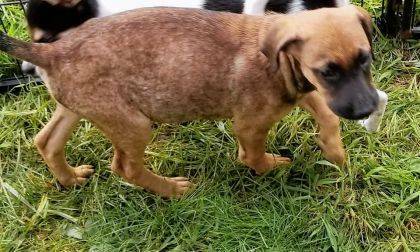 https://www.urbanacitizen.com/wp-content/uploads/sites/36/2018/08/web1_BarelyDogWeb.jpgTwelve-week-old Savannah is a Shepherd mix ready for adoption at Barely Used Pets. https://www.urbanacitizen.com/wp-content/uploads/sites/36/2018/08/web1_PawsCatWeb-1.jpgTillie, age 6, is a no-front-claws cat ready for adoption at PAWS Animal Shelter. https://www.urbanacitizen.com/wp-content/uploads/sites/36/2018/08/web1_LeagueCatWeb-2.jpegCartwright is a 10-week-old male kitten waiting to be adopted at the Champaign County Animal Welfare League. https://www.urbanacitizen.com/wp-content/uploads/sites/36/2018/08/web1_LeagueDogWeb-2.jpegFive 10-week-old male pups are up for adoption at the Champaign County Animal Welfare League.